During our trip to the Rocky Mountains in August 2016, we set out from Lake Louise to visit the Colombian Icefields. 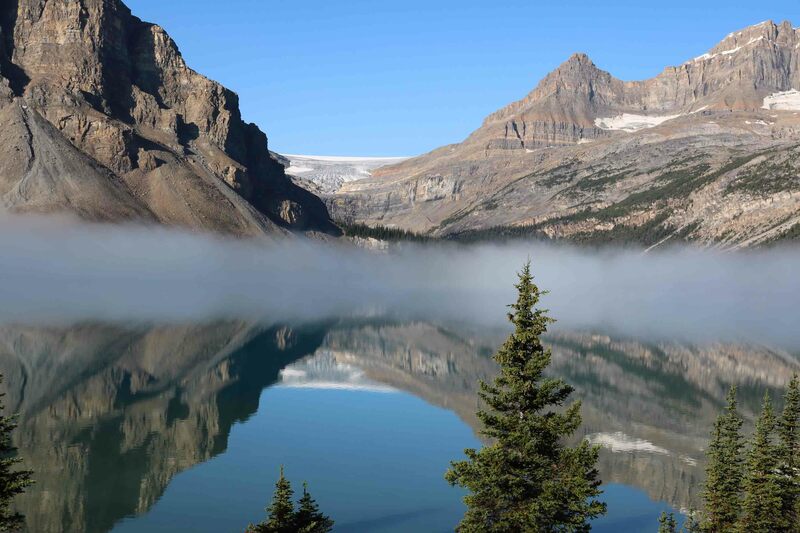 The road is rightly named as the Icefields Parkway as it offers a breathtaking view of the mountains, glaciers, rivers, waterfalls, lakes and valleys as one winds the way up. There is a high chance of encounters with wildlife enroute. 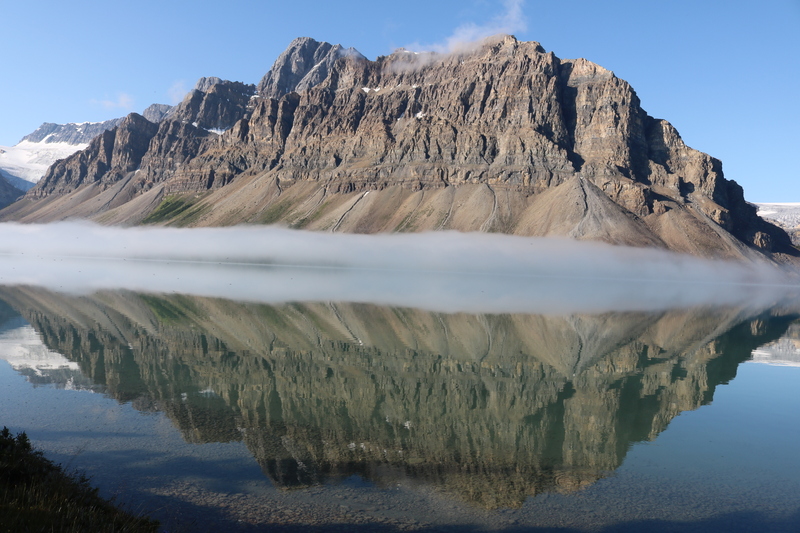 After about 30 minutes of drive, we were stunned by the beauty of Bow Lake, with its cool true-blue waters and mist overhanging the water. 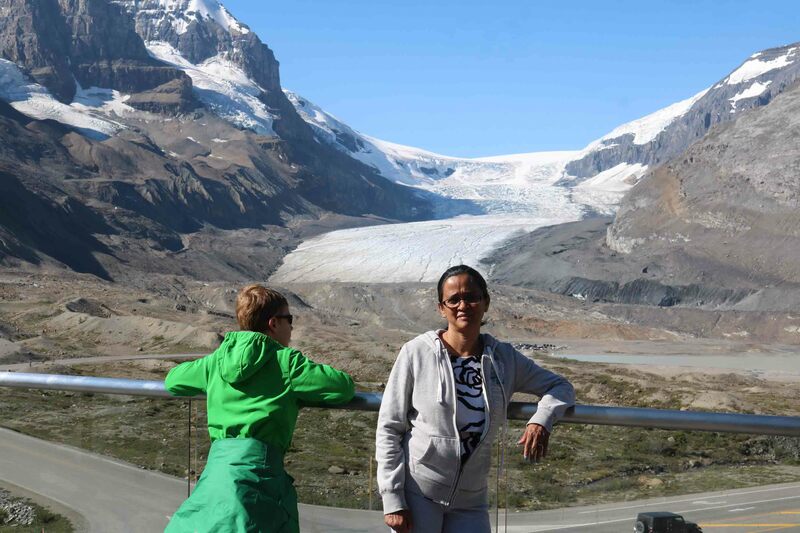 It offered a perfect picture-postcard shot with Crowfoot Glacier in the background, whose meltwaters feed the lake. Bow Lake is right adjacent to the highway and is one of the largest lakes in Banff National Park. 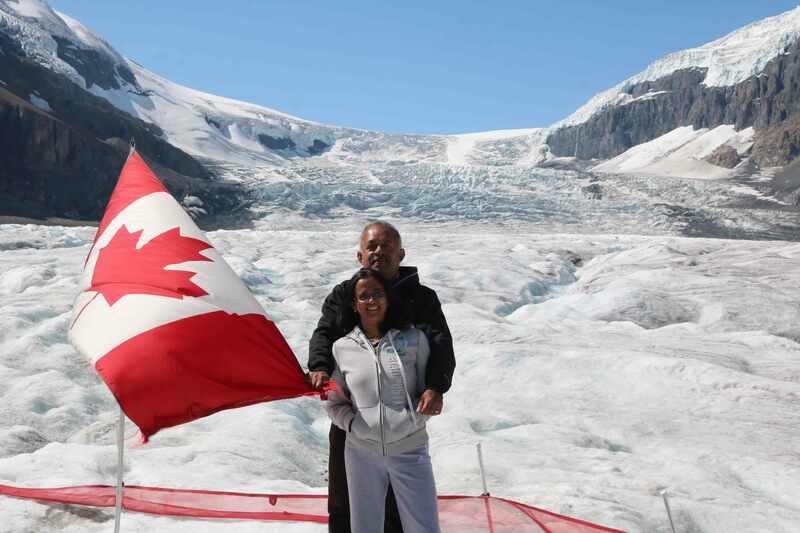 After spending about 30 minutes at the Bow Lake, we drove off to the Colombia Icefield Discovery Centre to undertake out trip to the Athabasca Glacier. The centre is operated only in summer (in winter the centre closes down) by Brewster Travel and located opposite the Columbia Icefields. Straddling the boundary between the Canadian provinces of Alberta and British Columbia (BC), the Columbia Icefields situated on the Rockies, is the largest ice mass in North America, south of the Arctic Circle. It is known as the ‘hydrographic apex of North America’ as the rivers emanating from these glaciers flow into three oceans – the Atlantic, the Pacific and the Arctic. In effect it becomes the centre of water distribution in North America. Only one other similar divide exists and it is in Northern Siberia. The Columbia Icefield, at an average elevation of about 3,000 m, covers an area of 365 sq km and has a maximum depth of 365 m. The highest points on the icefiled are Mount Columbia (3745 m) and Mount Athabasca (3,491 m). 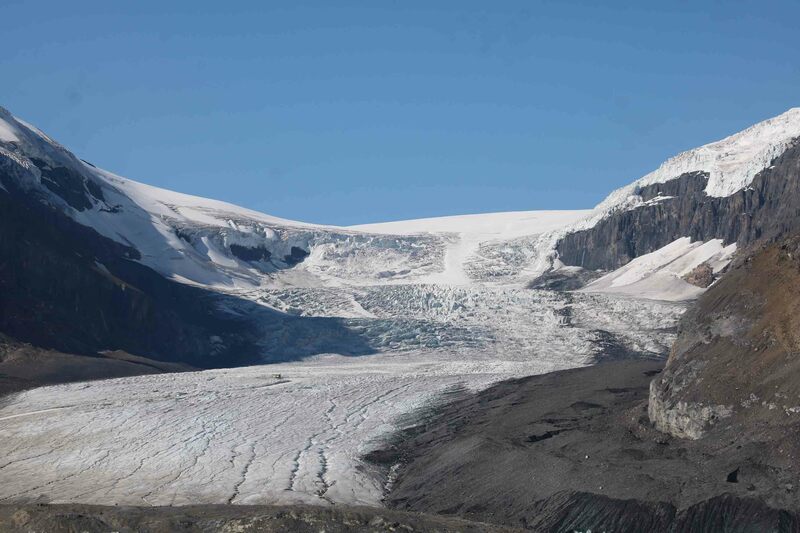 Six large outlet glaciers flow from the Columbia IceField – Athabasca, Castleguard, Columbia, Dome, Saskatchewan and Stutfield Glaciers. Meltwater from the Athabasca Glacier feeds the Athabasca River which flows into the Arctic Ocean traversing about 4,000 km. Water from the Saskatchewan Glacier enters into the Saskatchewan River further flowing about 2,600 km into the Atlantic Ocean. Water from other glaciers flow into the Fraser and Columbia rivers leading to the Pacific Ocean. If these glaciers recede or disappear, it would result in a catastrophic effect on the water supply of North America. 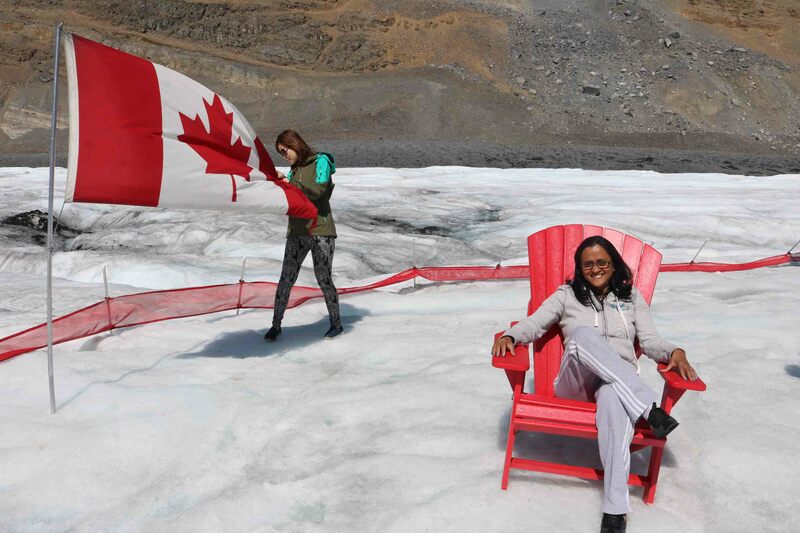 We boarded the all-terrain Ice Explorer – a massive vehicle specially designed for glacier travel for the Glacier Adventure – a ride onto the surface of the Athabasca Glacier. 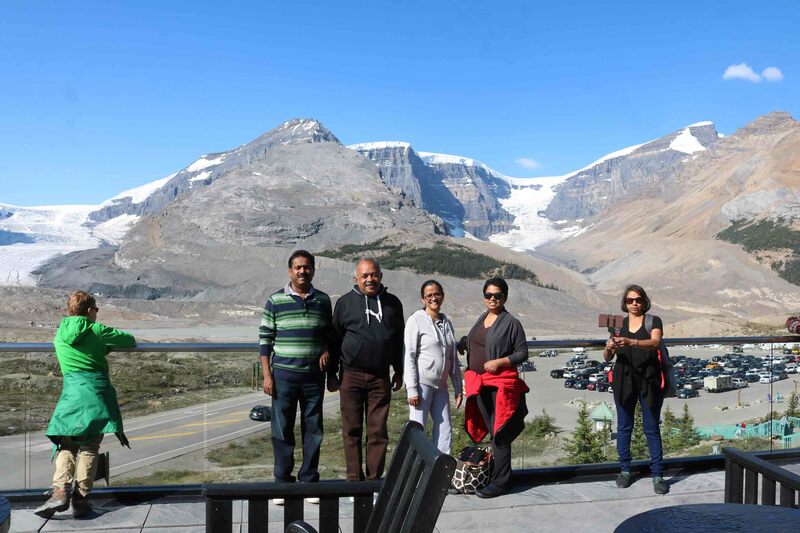 During this thrilling trip, the experienced driver-guide shared a wealth of fascinating information about glaciers, icefields, flora, fauna and their impact on our environment. 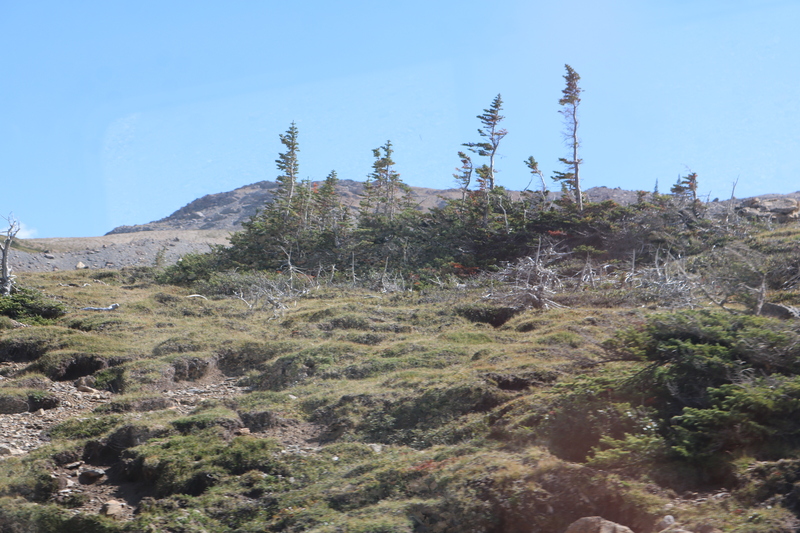 The Ice Explorer crawled its way up and our guide showed us the trees growing close to the glacier. She said they were almost 400 years old. These trees have not grown tall as they have only two to three months of growing time. Further, the cold winds blowing away from the glacier have ensured that the branches grow away from the glacier and the side of the tree closer to the glacier is devoid of any branches. As the Ice Explorer entered the glacier, we crossed the lateral moraines. When a glacier recedes, large amounts of debris – referred to as till – is deposited as linear ridges called moraines. As a glacier moves down a valley, the friction created by the valley sides forces deposition along the edge of the glacier. These depositions are referred to as lateral moraines. If a glacier is receding, lateral moraines provide evidence of how far the glacier has retreated. After crossing the moraines, the Ice Explorer halted on the glacier and the tourists dismounted on to the glacier to walk on the ice and fill their water bottle with fresh glacier water. It was perfect time to capture the beauty of the icefield’s breathtaking mountain setting. 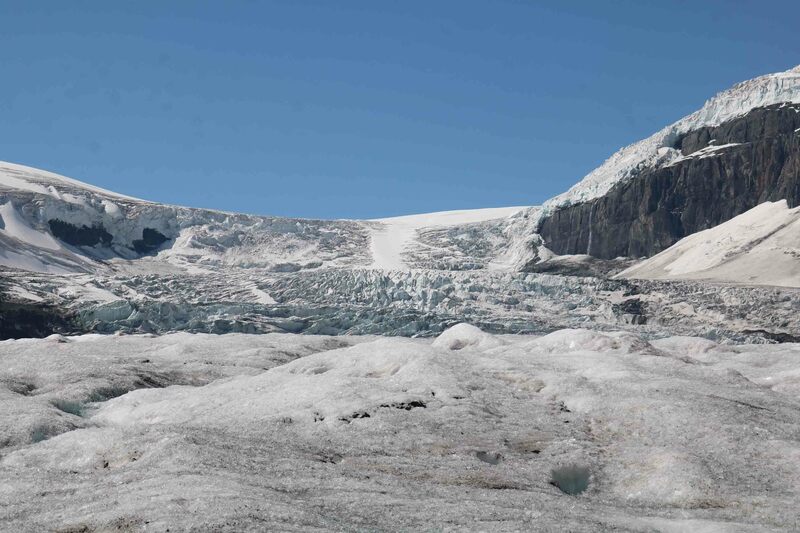 As the glacier flows farther away from the ice field and downhill, it becomes dirty and rougher in appearance. It is entering the zone of melting. Meltwater streams appear on the surface especially during the summer. When a glacier melts more snow and ice than it receives, it begins to recede. 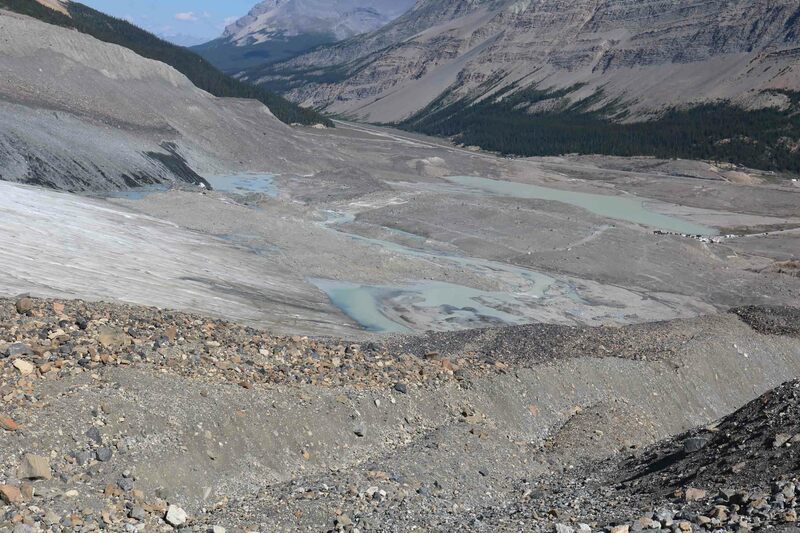 The Athabasca Glacier is receding in length and shrinking in volume at an alarming rate. The melting rate is faster now than it has been in the last 40 years. It appears that a combination of warmer weather and a dirtier surface that absorbs the summer heat are the sources of the problem. 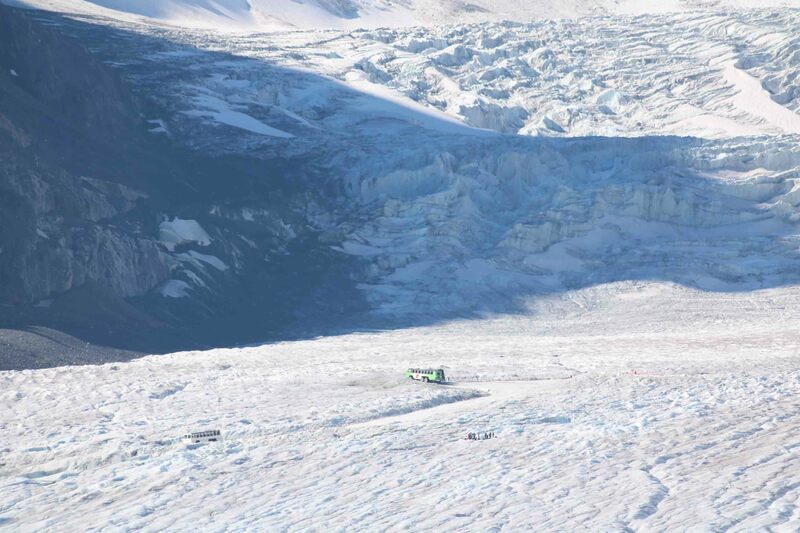 The glacier is shrinking by 30 percent every 100 years. At this rate it would be gone in 300 years. 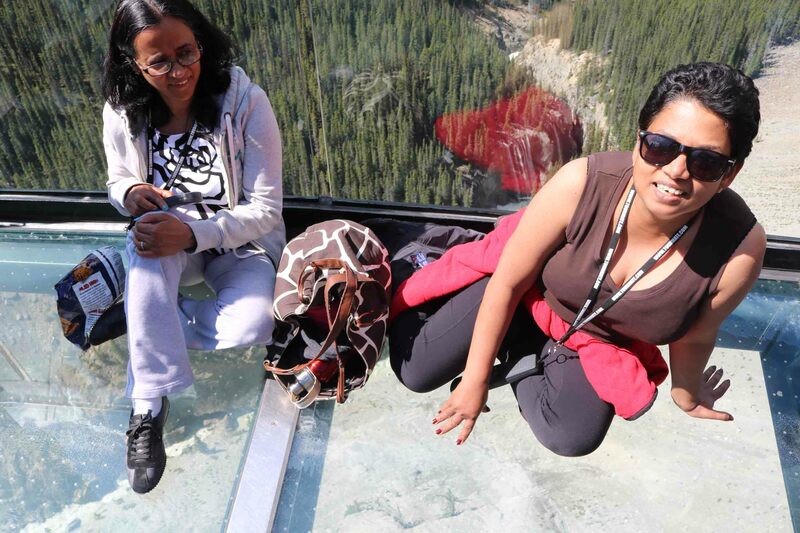 We boarded the bus at the glacier for the Glacier Skywalk, operated by Brewster. We were dropped at the cliff-edge walkway that extends along the Sunwapta Valley. The first 400 metres of the walk was along a cliff lined with six interpretive stations and an audio tour providing education about the area. 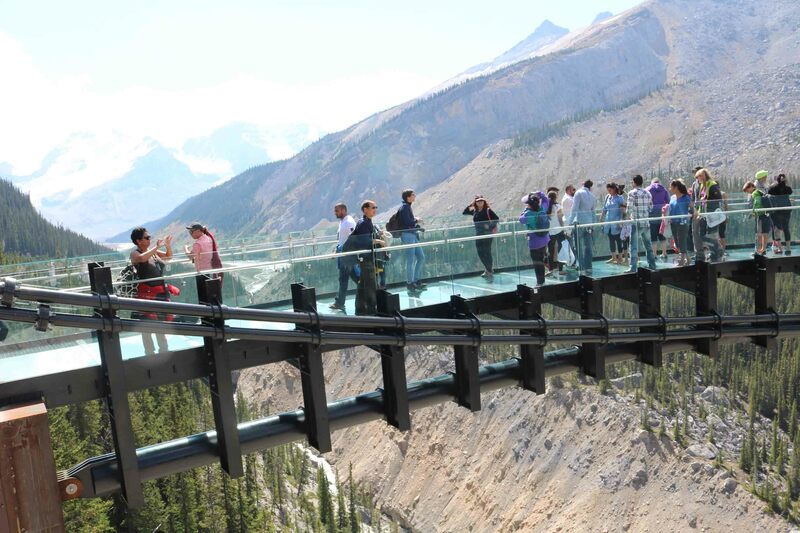 At the end of the walkway was a glass-floored observation platform 280 metres over the Sunwapta Valley, that extends 35 metres from the cliff. It offered a bird’s eye view and provided a unique perspective of nature at its finest. Looking down was the deep valley with the Athabasca River flowing and many waterfalls that leap from the cliffs into the river. One could see the birds flying below, feel the fresh air, relax and enjoy a one-of-a-kind experience.